Monitor Audio Silver RX6 review | What Hi-Fi? This review, following hard on the heels of the Monitor Audios' five-star First Test in the November issue means we've written about the Silver RX6s a fair bit lately. There's no reason to let them rest on their laurels, of course – the speaker market is constantly evolving and the RX6s will find themselves under threat from all directions. That said, the MAs give every impression of being set fair for the long haul. Compact and slender, the RX6s are smoothly finished in real-wood veneer (the ubiquitous high-gloss piano finish is also available). Only the ungainly plinths, which make the speakers look as if they're standing in a shower-tray, strike a false note – in all other respects, the RX6s look the part. Given a good running in, positioned in a modicum of free space and toed-in slightly towards the lister, the RX6s sound every bit as alluring as they look. If there's a trickier test of attack and dynamics than Pixies' Tame we've yet to hear it, but the Monitor Audios move through it confidently, switching from a hum to a bellow and back again without stress. Low frequencies are solidly punchy and tonally varied, the leading edge of bass plucks or hits translated with alacrity. There's a detail-drenched vocal, well separated in the midrange, and the clattering top end is crisp without spilling into hardness. A switch to Moondog's Pastoral allows the RX6s to demonstrate further their versatility. They're an energetic, energising listen, with the sort of subtlety and manoeuvrability to lay bare all the fine details without losing sight of the overall picture, and remain composed even at antisocial volumes. In fact, the only real shortcoming this test has exposed is a slight reluctance to organise complex recordings quite as martially as is ideal. 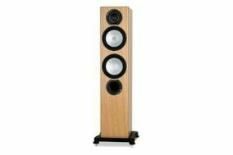 In every other respect, these are hugely capable and extremely enjoyable loudspeakers.